Joust 2: Survival of the Fittest is an arcade classic platform game developed and published by Williams Electronics released in 1986. I always enjoyed the original Joust and always wanted to try out the sequel. 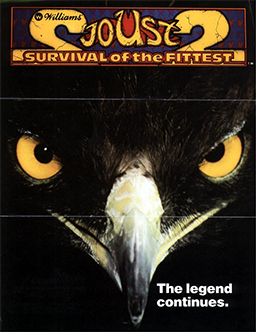 While part 2 is similar to the original, there is an added technique where you can transform your character from an ostrich to a pegasus. There is also more than just typical ostrich bad guys to take out. There are bats, bigger robots that spawn bats and even a giant robot. Also, if you happen to not collect the egg of a defeated foe and it falls into the liquid below, instead of disappearing it will transform into a more powerful foe. I have only played the first 10 or so levels and I know there are a few other unique levels that I have not seen yet. The graphics in Joust 2 are a step up from the original with an amazing 101+ levels to play on. Since this is a single screen game, it is not incredibly complex, but there are a ton of little additions that make part 2 stand out from the original. There are a ton of larger stage enemy types that just look badass and everything has a Egyptian feel to it. The sound is superb, with the music especially sounding like it was crafted on the Commodore 64 with a lot of bass and computer synth present. This is a game that I would like to see a soundtrack released for. The controls are very tight with a distinct feel from the ostrich to the pegasus with both speed and control. You still need to be at a higher level than you foes to take them out which still requires a lot of skill. Some of the extra stages require a bit more precision than the original and can create for an interesting experience. Joust 2 is extremely fun due to the combination of different levels that keep it feeling fresh while still adhering to the standard Joust formula. It is very satisfying to plow through multiple enemies hearing them pop and sending them to oblivion. Joust 2 still has cooperative 2-player action which can be fun but extremely chaotic. I can already sense a lot of yelling will be going on when we play this game, which is not a bad thing. As for challenge, due to the fact that you can continue on the level that you died on, it makes this game very beatable. However, there is no definitive ending that I know of so it would kind of be pointless to play this game too long. Overall, Joust 2 is a step up from the original and adds in many little nuisances that keep the tried and true formula from getting stale. While the game can get extremely chaotic and the increased AI intelligence becomes very merciless, the fact that you can continue until you run out of money means that this game is in beat ’em up territory of quarter munching. I feel that Joust 2 is a solid arcade title and a very great sequel, worth a try by any fan of arcade classics. 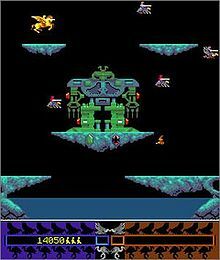 This entry was posted in Uncategorized and tagged Arcade, games, Joust, Joust 2, mame, retro, retro gaming, video games. Bookmark the permalink.